Mary, the color orange is beautiful during the Autumn season! I love your tray and the pretty images. The scene from your walk is beautiful! Thanks for hosting and I wish you a happy week ahead! 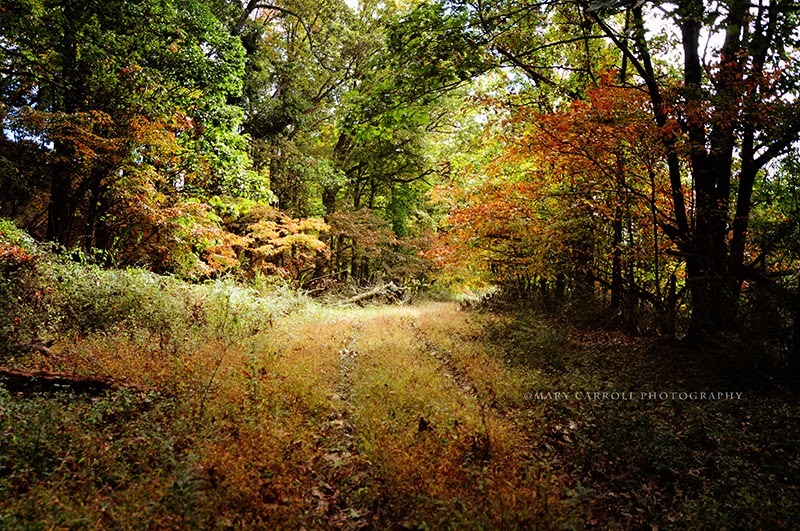 Your orange hues among autumn's many woodland treasures are both radiant and calm, as I imagine your walk in such a beautifully serene forest must have been. I adore tole trays and your image featuring this particular one, is rich with texture and mood. It wouldn't be autumn without the warm tones of orange found in nature. Your photos are exquisite. Thank you for hosting Mosaic Monday and, as it is Thanksgiving weekend here, may I wish you an early Happy Thanksgiving. Oops. I added the wrong link (#4 with the red apples). I don't see a red x for me to be able to delete it. Sorry, Mary. Perhaps you could? Thank you. It was nice to see colors of autumn in your, area, Mary! 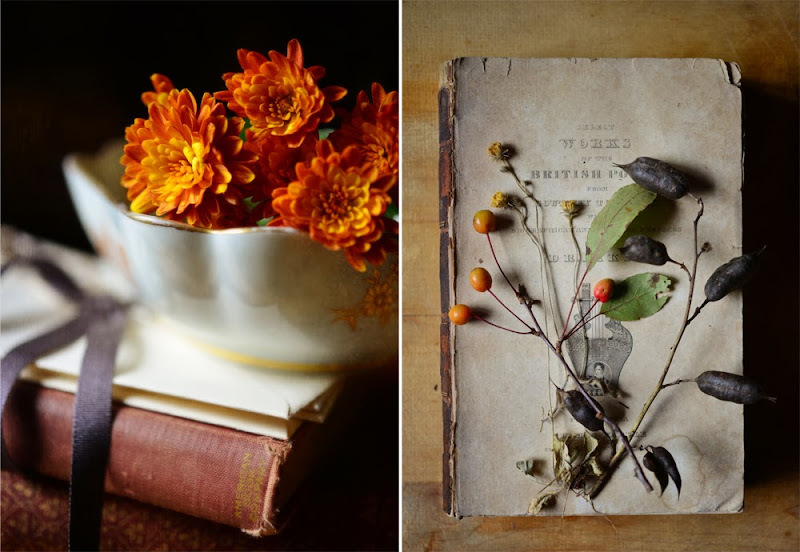 Your photo of the vintage book with the white bowl and orange flowers is so wonderful (I love all your photos). Thanks again for hosting Mosaic Monday. Your pictures are beautiful...simple and so pretty! Thanks for doing Mosaic Monday, it is one of my favorites! Your touches of Fall are so pretty! I am enjoying the colours you are featuring for your recent mosaics. 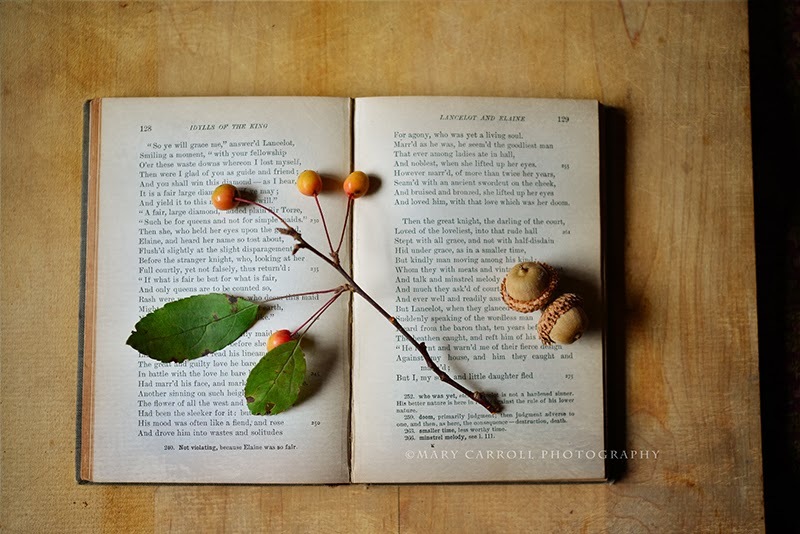 The antique books are lovely with seedpods and berries on them. orange is certainly the colour of autumn and you have put together a delightful selection. I have been away for 6 weeks touring around my vast country, and am happy to be back at Mosaic Monday and catching up with what has been going on in blogging world. 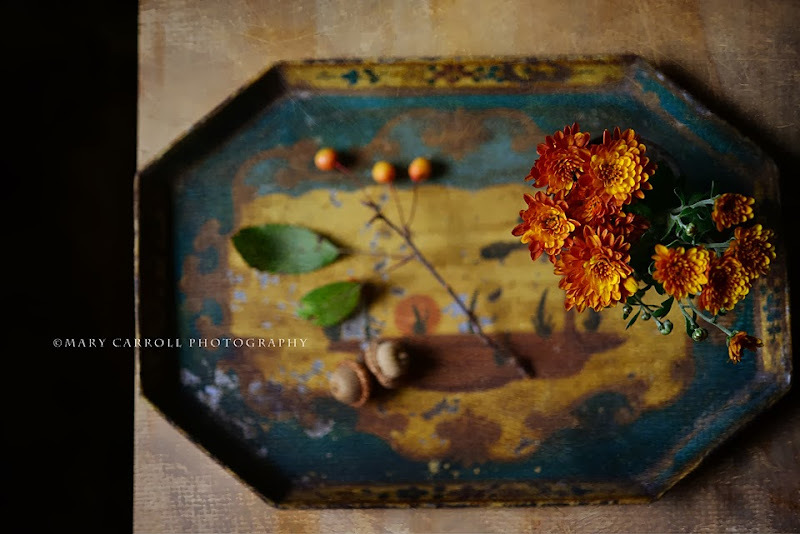 I love your still life vignettes and your pretty outdoor fall photo. Your photography is lovely! Orange is not typically one of my favorite colors, but this time of the year, I just LOVE it! Fall is truly my favorite time of year. Thank you for hosting the party and have a great week! Truly a feast for the eyes and soul. So taken with the acorns and the lovely forest, rich with colors. Thank you for hosting. I absolutely love your Natirar nature scene shot! Great captures. Such wonderful photos Mary. Thank you for hosting Mosaic Monday. Orange is such a great colour, can remind us of spring flowers, summer's hot sun or autumn's leaves. Oh Yes! I love love love orange, too! Thank you for the beautiful photos, and for hosting the partay. I am always in love with your Monday Mosaics, and the concept. I really need to remember BEFORE Monday and plan ahead! Beautiful nature shots - and true to "now." This is my first time participating. 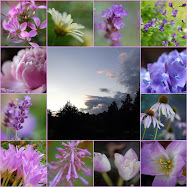 Thanks so much for the fun prompt of a collage or mosaic of photos. The photo of the tray and botanicals is beautiful, Mary. Orange isn't any where near my favorite color, but you've made it quite lovely. Extremely gentle and beautiful photographs this week Mary. I love each one. Beautiful fall shots. I love that first one with the book. I always come back from my walks with something too - nature is so inspiring! Love your orange and your blue tole tray. I just began blogging again and can't wait to get back to Mosaic Monday. Love your orange photos. not such a short season, love the colors. Most small and medium sized businesses these days would rather use Toll Free Numbers to reduce costs on multi-line phone systems. For them, budget is probably the most crucial things. This has got to be one of my favorite photo mosaics! Can you tell I love orange and autumn?